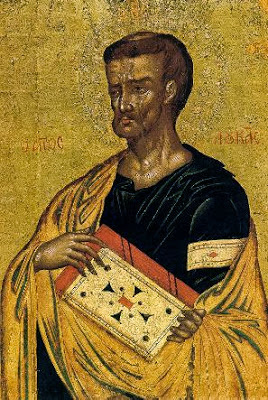 The Evangelist Luke, "the beloved physician" as the Apostle Paul calls him, is the author of the Gospel According to Luke and the Acts of the Apostles. A native of Antioch in Syria, he belonged to the chorus of the Seventy Apostles of Christ. He was a close associate of the Apostle Paul and accompanied him on his journeys in Troas, Philippi, from Philippi to Jerusalem and from Caesarea to Rome. He was also with him both times he was imprisoned. Indeed, during his second imprisonment, the Apostle Paul writes in his second epistle to Timothy that "Luke alone is with me". The Evangelist Luke preached the Gospel in Dalmatia, France and Italy. Also in Boeotia and in Achaia, where he composed, according to St. Gregory the Theologian, the Gospel According to Luke. According to tradition, he was a painter and he depicted the Theotokos. He had an agonizing end, as indeed all the Apostles. Only John the Evangelist "was perfected in peace", and this happened because he experienced martyrdom "next to the Cross of Jesus." The relic of Saint Luke was transferred to the Sacred Church of the Holy Apostles in Constantinople in 357 A.D.
First, for someone to serve a person of power and glory is very natural according to the logic of the world and they justify this by the fact that for the inconvenience and toil given, a return awaits them. But for someone to toil and be inconvenienced for serving one who has no worldly power and therefore does not expect to reap something, and most importantly remains close to that person during trials and temptations, this exceeds fallen human logic, but also highlights the majesty of selfless love. For everything that does not agree with fallen human logic is not necessarily irrational, but it can also be super-rational, as is it is with true, selfless love. True love is not just a feeling, but sacrifice and a cross. Second, in the 24th chapter of the Gospel of Luke, Luke the Evangelist refers to an event of a meeting he had with the risen Christ, three days after His burial. While walking along the road to Emmaus with the Apostle Cleopas and sadly discussing on the road all that took place over the previous three days, the risen Lord approached them and walked beside them. The events that followed are well known, how He interpreted for them the events that took place according to the Scriptures, such as His Passion and Resurrection, and this caused their hearts to burn within them. But they did not recognize who He was. This happened later during "the breaking of bread". That is, when He blessed the bread, He changed it into His Body and offered it to them as food. In fact they recognized Him, rather Christ "made Himself known to them", by revealing Himself to them during the Divine Liturgy. And although at the same time He disappeared, their hearts burned within them as earlier, and they were full of joy. This is why they left immediately and returned to Jerusalem, to announce the joyous event of the resurrection of Christ to His eleven disciples. Hearts which are aflame with love for Christ, have the ability, under the right conditions, to know Him in the Divine Liturgy, in "the breaking of bread". This is not an emotional or psychological knowing, but an existential and ontological one. Saint Theophylact, Archbishop of Bulgaria, says that all who receive the Body and Blood of Christ, of course under the right conditions, the eyes of their soul are opened and they recognize Him, because the flesh of the Lord has great power and invites great joy. "Those who receive the blessed bread, their eyes open to recognize Him. The flesh of the Lord has great and ineffable power... The two disciples rejoiced, so that they got up and returned to Jerusalem." We saw above, during the meeting of Christ with His two disciples as they were walking "towards Emmaus", that the interpretation of the Divine Scriptures preceded the Divine Communion. The same exact thing is repeated during every Divine Liturgy. The reading and interpretation of the Apostolic and Gospel passages is followed by the consecration of the Honorable Gifts and Divine Communion. And the reading is preceded by a prayer, which the priest reads silently, asking God to shine His divine Light in his heart and to open his mind that he may understand the Reading, so that he can interpret and transmit it to the people in a comprehensible and especially Orthodox way. He also asks God to implant in his soul divine fear, that he may be able to trample carnal desires and live a spiritual life, which is difficult and without the Grace of God is impossible. To minister to "our neighbor", to every person without discrimination, and particularly the simple and despised and "the least", without selfishness, is a character trait of the saints, who know Love existentially, namely the Triune God, but in a similar proportion with all those who strive to achieve their personal sanctification. Source: Ekklesiastiki Paremvasi, "ΕΥΑΓΓΕΛΙΣΤΗΣ ΛΟΥΚΑΣ", October 2007. Translated by John Sanidopoulos.